University of Notre Dame Press, 9780268101312, 506pp. The Irish Revival of 1891 to 1922 was an extraordinary era of literary achievement and political ferment. This period generated not only a remarkable crop of poets and writers but also a range of innovative political thinkers and activists. The contributors to this period exchanged ideas and opinions about what Ireland was and could become, yet much of this discourse remains out of print, some of these voices almost forgotten. 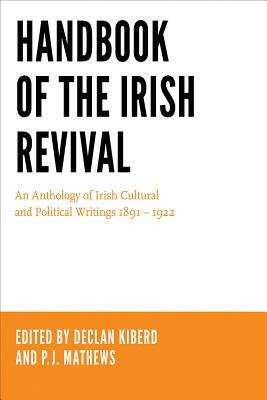 Handbook of the Irish Revival: An Anthology of Irish Cultural and Political Writings 1891-1922 collects for the first time many of the essays, articles, and letters by renowned figures such as James Joyce, Maud Gonne, W. B. Yeats, George Bernard Shaw, Sean O'Casey, and J. M. Synge, among others. The anthology also contains pieces by less well-known individuals such as Stopford A. Brooke, Mary Colum, and Helena Molony. Many of the lesser known texts contextualize the social, political, and cultural lives, values, and aspirations of those involved in and on the periphery of the Revivalist movement. The introduction and commentary by Declan Kiberd and P. J. Mathews convey the ideas of a brilliant generation that, in spite of difficulty and demoralization, audaciously shaped a modern Ireland. Divided into sixteen sections covering issues as diverse as literature, religion, drama, education, women's rights, and the 1916 Rising, this is the ultimate reference book for anyone with an interest in Irish literature and history. Declan Kiberd is the Donald and Marilyn Keough Professor of Irish Studies and Professor of English and Irish Language and Literature at the University of Notre Dame. He is the author of numerous books, including, among others, Inventing Ireland and Synge and the Irish Language. P. J. Mathews is senior lecturer in the School of English, Drama, and Film at University College Dublin. He is the author of Revival: The Abbey Theatre, Sinn Fein, the Gaelic League and the Co-operative Movement and editor of The Cambridge Companion to John Millington Synge.